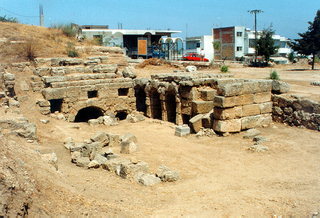 The site is located in the central part of the extensive Rhodian necropolis and relatively close to the exit from the ancient town. Within the same burial complex it is interesting that large tombs for interments existed side by side with small cists for vases containing the dead person's ashes. Also interesting is the existence of a subterranean quarry. On the south side of the open-air archaeological area is a large revetment wall retain the upper terrace, in accordance with the Rhodian custom of building with terraces. The site was excavated by the Italian archaeologists, but little is known of the results. Large corner complex with vaulted tombs for interments in sarcophagi and rectangular cists for vases and ossuaries. Above are a crepidoma and exedra. A cluster of vaulted tombs and cists. Above them is a podium, and the top of the monument is crowned with triglyphs and metopes. Monumental hewn rock, forming a gateway. Monumental terrace wall of large poros blocks to retain the upper level of the necropolis hill. Subterranean burial chambers with representations of tombs and grave goods.